Our outreach youth workers rescue the street children from street, launch terminal, railway station, bus station big shopping centre under the bridge and flyover between age 5 and 17. The transitional shelter will ensure short term inclusive support to rescue children. The aim of the transitional shelter is to build referral systems with other charities to ensure that rescue children are being looked after until the adolescence age. We also help rescue children return to their families through family re-integration program if they want or they have opportunity, Muslim Charity provides the finding for this shelter. LEEDO runs informal Schools Under the Skyusing ‘Human Values’ and ‘Living Values’ programmes in areas where street children are concentrated. This includes train and bus stations, market areas and launch terminals. This approach to schooling is designed to educate street children, enabling them to read and write as well as to receive essential life-skills training. These schools offer a safe place, where children can socialize, network with each other and learn from each other's experiences. This is also a platform for informal group therapy, where youths canpick up information, grasp opportunities and develop life skills through hearing firsthand about the experiences of other children and how they learnt to be resilient. We now have two schools at Rayer Bazar and Sadarghat Terminal. We have 150 children who regularly attend our Schools Under the Skywith another hundred whose attendance is irregular. This strategy enables us to send many children on to formal schooling. We run a Mobile School specifically for Street Kids in various catchment areas in Dhaka. It is an innovative project to educatestreet kids and make them aware ofhow to keep safe and develop a goal for life. The education system is based on games and entertainment. Mobile schools are also a means of rescuing street children. This is a new intervention for us and for Bangladesh and both requests for it and reactions to it have exceeded our expectations. We hope that it will make great changes to the lives and prospects of street children. LEEDO has a new home (It is generous supported by family of Dear Carl and Dear Liz ) named PEACE HOME with full facilities where parentless and destitute street children can begin to lead more normal lives. It is the first permanent home specifically built for street kids and there is no discrimination between boys and girls, abled and disabled. The children are supported here until they can be mainstreamed. We now have 50 children, both boys and girls, in this home. We also have 15 special needs children with various kinds of disabilities. They are provided with facilities such as food, education, clothes, healthcare, etc. We are trying to make their lives easier and happy. 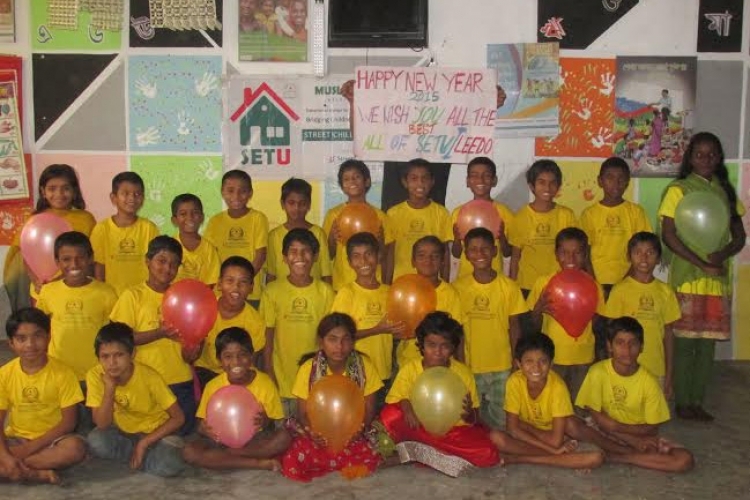 They are regularly attending formal school and gradually building new and better lives. Local Education and Economic Development Organization – LEEDO - is a non-profitable and voluntary based development charity established in 2000 (fully functioning from 2010) and initiated by a group of educated social activists aiming to improve the lifestyle of Street Children who are living in difficulties on the streets because they are very vulnerable. LEEDO is based on the philosophy that helping street children requires offering them choices within their environment and assisting them to make their own decisions which will in time lead away from the street. The mistaken belief that rescuing street children involves removing them from the street as quickly as possible often does more harm than good, resulting in failed rehabilitation and a return to the street.